Add HEAT building sun salutations to your regular practice to keep warm this fall. As ALWAYS please consult your doctor before making any major changes to your physical routines, and be CAUTIOUS of poses that could further injure a recent injury, surgery, or medical problem. Make sure you warm up a little before you start your sun salutations. Whatever poses you typically use to warm up during your regular routine should do the trick. I like Eka Pada Apanasana, Apanasana, the Supta Padangusthasana series, Cat/Cow, and then straight into Downward Facing Dog. Bring yourself to the front of your mat from here and begin your Sun Salutations, A.K.A. Surya Namaskar A & B. 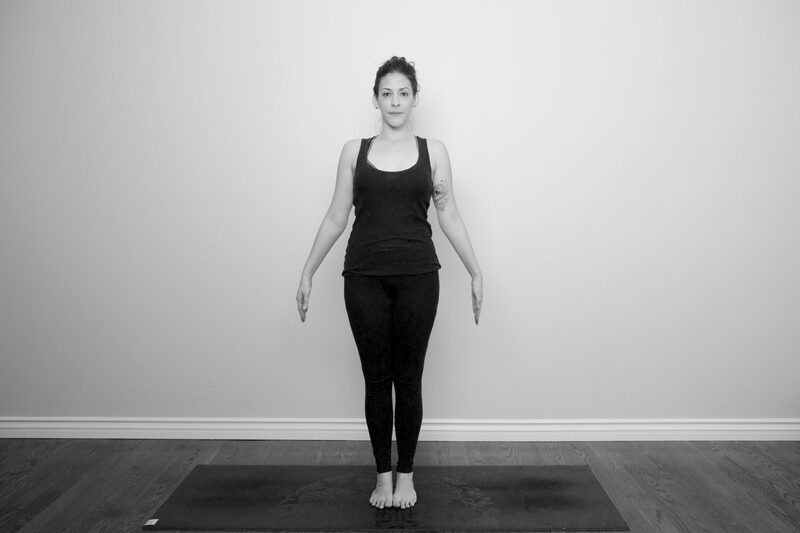 For the first round of “A” hold your poses a bit longer (3-5 breathes each). 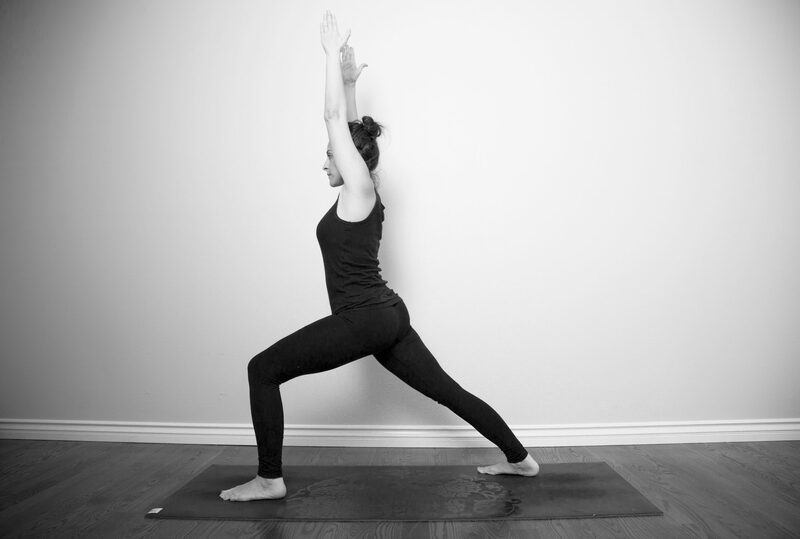 Each round after this you can begin to increase the speed of the poses (shorten the length of time you hold each pose). You can always just do Surya Namaskar A and then add a few poses after, as well as a cool down… OR you can follow Surya Namaskar A with several rounds of Surya Namaskar B (instructions below). Standing at the front of your mat, stand with your feet together, rooting down through all four corners of your feet, lifting up through the knees and engaging the quadriceps to straighten the legs. Release the flesh of the buttocks down as you lift the frontal hip bones up. Firm the side hips in. Lengthen all four sides of the torso evenly. Releasing the front ribs down towards the frontal hip bones, as you lift the back ribs up. On an inhale lift the arms up over the head towards the ceiling. Arms are straight, palms facing one another. Spread across the collarbones, draw the shoulders away from the ears. On an exhale fold forward from the hips. Firm the side hips in. Feet together. Root down through all four corners of the feet, lifting up through the inner and outer arches. Contract the quadriceps to lift the kneecaps. Allow the torso, the front body, to fully fold forward and begin to lengthen and find space. Lengthen the sternum away from the navel. *I am not doing a traditional Ardha Uttanasana in this photo, I am holding my big toes. The pose is still correct however, so just place your hands on the floor in front of your feet, onto blocks, or your shins instead of holding the toes. From Uttanasana, on an inhale lift the sternum and either place the hands on the floor in front of your toes, onto a block, or on your shins. Feet are together. Rooting down through all four corners of the feet, lifting up through the inner and outer arches. Contract the quadriceps to lift the kneecaps. *Traditionally you would just go straight from Ardha Uttanasana into Chaturanga so please feel free to do just that. 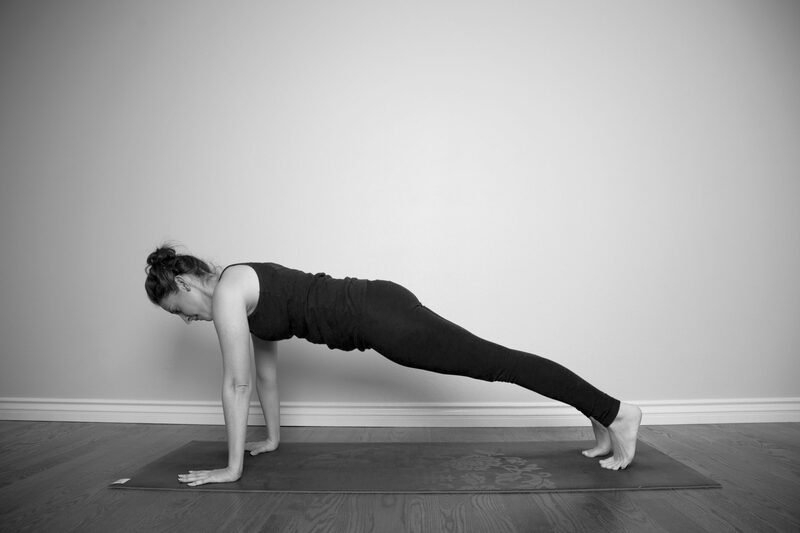 I find that when I practice I like to lower into Chaturanga from Plank so I’ve written it as I teach it and practice it. Hands are shoulders width apart and stacked directly under the shoulders. Feet are hips width apart. Root down through the entire hand, and rebound up through the arms. Root down through the ball points of the feet, and lift up through the inner and outer heels. Keep the arms straight, inner and outer arms firm. Spread across the collarbones, drawing the shoulders away from the ears and shoulder blades in towards the spine. Keep the neck in line with the spine. Engage the lower belly to protect the spine. Draw the belly button up towards the spine. Draw the flesh of the buttocks towards the heels, hip bones towards the front ribs. Press back through the heels, engage the quadriceps to lift the knees, inner thighs lift up towards the ceiling. Feet hips width apart, toes curled under. Palms are flat, shoulders width apart and alongside the ribs, elbows stacked directly over the wrists. Draw the elbows together so they’re alongside the ribs, upper arms straight in line with the shoulders. Spread across the collarbones, shoulders drawn away from the ears. Lift the shoulder heads up towards the ceiling, and draw the shoulder blades in towards the back ribs. Keep the head in line with the spine, looking just forward of the front of your mat. Draw the navel in towards the spine. Buttock flesh releases down towards the heels, frontal hip bones lift up towards the chest. Curl the toes under, press down firmly into the hands, inhale and draw the front body up between the arms, lifting the sternum up towards the ceiling. Hands are shoulders distance apart and stacked directly under the shoulders. Feet are hips distance apart, tops of the feet touching the floor and pointing straight back. Root down through the hands, and lift up through the forearms. Root down through the tops of the feet, and lift up through the legs. Spread across the collarbones, and draw the shoulder blades in towards the spine. Keep the shoulders drawn away from the ears. Lengthen the sides of the neck evenly, and lift the gaze just slightly (do not compress the neck). Lift the front of the body from the navel to the sternum, keeping the front ribs soft (as not to puff them out). Inner thighs lift up towards the ceiling, the entire leg lifts off the floor. Reach back vigorously through the legs, feet, and toes. Exhale curl the toes under, lift the hips up towards the ceiling and press yourself up into downwards facing dog. 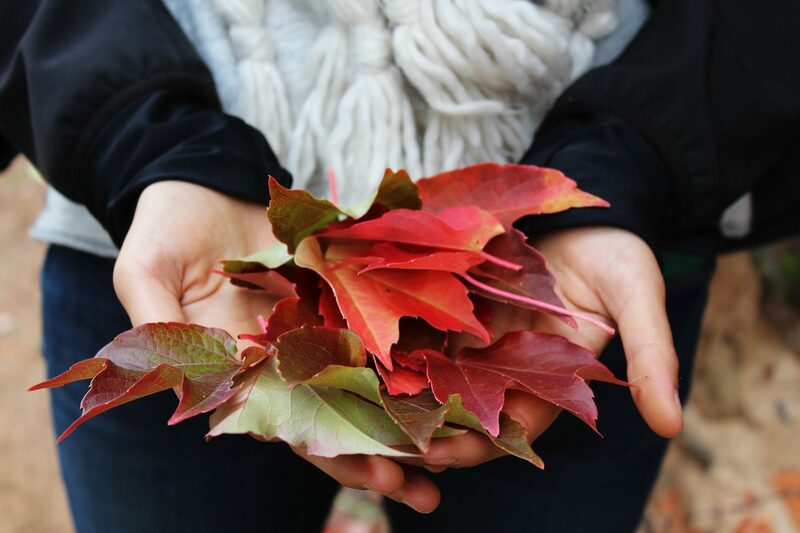 Hands are shoulders distance apart. Feet are hips distance apart and parallel, toes pointing directly forward. The hands and feet are at such a distance from one another that the body creates a 90* angle. Root down through the hands, as you lift the forearms up and away from the floor. Root down through the feet, as you lift the inner and outer arches. Press the floor away with your hands, firming the upper inner arms to prevent hyperextension of the elbows. The neck is in line with the spine and allow it to relax and hang freely. Draw the shoulder blades in towards the spine, while keeping the front ribs soft (don’t allow the front ribs to collapse towards the floor). Draw the shoulders away from the ears. Direct the lower front ribs and the frontal hip bones towards one another. Use the strength of the legs to lengthen the spine by pulling the hips off the waist, and reach back evenly with the inner and outer thighs. This is the end of Surya Namaskar A. As mentioned above you can end here by adding a few of your favorite poses and a cool down, OR you can go straight into Surya Namaskar B. Either way feel free to add any poses that you love in between A & B or at the end of either. Just make sure you do a cool down no matter what. My favorite cool down poses are: Prasarita Padottanasana A, Dandasana, Janu Sirsasana, Paschimottanasana, Setu Bandha Sarvangasana, Simple Twist & Legs Up The Wall…to name a few. On an inhale lift the arms up and bend the knees to bring yourself into Utkatasana or chair pose. Feet together or slightly apart (this will depend on your knee health, I prefer having the knees slightly apart). Outer edges of the feet are parallel and the second toes are in line with the center of the heels. Root down through all four corners of the feet, and lift up through the inner and outer arches. Shift more weight into the heels. Release the inner thighs down as you lengthen the buttocks down towards the floor. Lift the frontal hip bones up, and the pit of the abdomen in and up. Lift all four side of the torso up evenly, as you soften the front ribs down towards the hip bones and draw the back ribs up. Reach up through straight arms (palms face one another), as you draw the shoulders away from the ears. Wrap the outer shoulder blades up towards the fingertips (upward rotation). Keep the gaze up or forwards but do not allow the head to drop. Lengthen all sides of the neck evenly. On an inhale bend the right knee and bring the foot in between your hands (so that your right foot is just beside your right hand). Dial the left down so that the entire foot is now rooted into the floor and turned out slightly. Now lift the arms up towards the ceiling. Take a look at your feet and make sure they are lined up heel to heel or even slightly wider. I like to widen my stance in this pose slightly, it’s a bit more stable and you’ll have better balance. Make sure if you do decide to widen your stance that you do it just slightly. Rooting down through the front heel and outer edge of the back heel. Front leg – Stack the knee directly over the heel, and align the center of the knee with the second toe. The leg is bent at a 90* angle (you’ll need to adjust your distance so this is possible). Front foot pointing straight forward. Release the inner and outer thigh evenly down towards the floor. Back leg – Engage the quadricep to straighten the leg. Revolve the outer knee, thigh, and hip forward until the hips are even and parallel. Square the hips towards the wall in front of you by drawing the front hip back and the back hip forward. Release the flesh of the buttocks down, as you lift the frontal hip bones up. Revolve the torso forward to face the wall in front of you, and elongate the sides of waist. Soften the front ribs towards the frontal hip bones. Broaden across the collarbones, and draw the shoulders away from the ears. Wrap the outer shoulder blades up towards the fingertips (upward rotation). Arms are straight, lift up through the wrists and fingertips. Keep the neck relaxed and gaze forward or up towards the thumbs, but do not drop the head. Have fun & as always practice safe!